How Much Does it Cost To Fly To Jacksonville? The cheapest flights to Jacksonville found within the past 7 days were $107. Prices and availability subject to change. Additional terms may apply. You’ve always been drawn toward the coast. Facing the ocean, the scent of salt swirling through the breeze, the sight of the sun catching the waves brings a smile to your face. A bustling world may sit just behind you on the boardwalk, but ahead of you lies only an underwater world full of secrets and an air of mystery. You grab a light-weight oar, and before you know it you’re stand up paddle boarding in gentle waves. Navy water gives way to baby blue skies, and you can’t help but feel at peace. Welcome to Northern Florida. 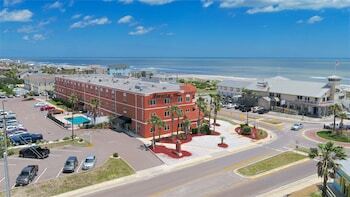 The perfect blend of seaside and landlubbing, Jacksonville makes it easy to stay active. This is no couch surfing, wise wanderer. You’re after a real surfing adventure, and you’ll get it. After your time on the water, 80,000 acres of parkland are ripe for exploration. Put on your hiking boots and venture to state parks and unfettered wetlands with camera in hand. Everything from gardens and campgrounds to live entertainment awaits on the other side of a Jacksonville flight. Book now, and your great getaway is in motion. Flights to Jacksonville land at Jacksonville International Airport (JAX). Whether you’ve booked a room on the beach or you’re staying downtown, one of the best ways to get to your hotel is a car. Parking is plentiful in the city, and having your own wheels means Greater Florida is at your disposal on your own schedule. If you want someone else to take the wheel, taxis, limousines, and shuttles are also available at the airport; all ground transportation is next to the baggage claim on the lower level of the terminal building. Jacksonville’s compact city core makes walking a viable option or just hop on the public transportation. Take the River Taxi to admire the skyline from the water or the automated Skyway to glide above city streets or across the St. John's River. Over 30 bus routes crisscross the city and the two trackless trolley lines give more intimate views of the river and the beach. Amelia Hotel at the Beach: Bone-white sand will be just steps from your room when you stay at the Amelia Hotel at the Beach. As far as beach getaways go, Amelia Island is a prime destination. Play a few rounds of golf at the adjacent course or take a dip in the crystal clear pool. This is bliss. 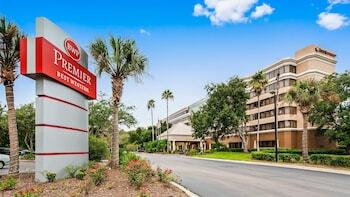 Hyatt Regency Jacksonville: The Hyatt is in the heart of downtown, perched on the north shore of the St. John’s River. Contemporary décor and a rooftop heated swimming pool are just a few of the modern amenities aimed to impress you. And impress you they will. One Ocean Resort & Spa: Floor to ceiling ocean views and a full service coastal spa will lure you to this hotel. Once you’ve experienced a body wrap and relaxing massage, you’ll be happy you followed your instinct. Aside from the world-class spa, the hotel also offers organized yoga classes and bike rentals. 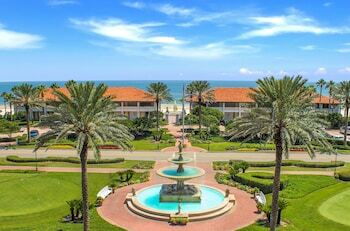 Omni Amelia Island Plantation Resort: Luxury is your brand, wise wanderer, and the Omni caters to it. This resort sits on more than 1,300 acres and has a 3.5-mile private beach. When you’re not sipping coffee on your private balcony or taking a dip in the hotel’s adults-only infinity pool, you can explore more than a dozen boutiques. Sometimes flight deals to Jacksonville include a layover, providing you a few hours to get a taste of the Bold New City of the South. Instead of meandering through the terminals, a trip to the nearby River City Marketplace or Seton Creek Historic Preserve is in order. Of course, a longer stay gives you even more opportunity to become acquainted with northeast Florida. Go kayaking off the coast or spend your morning hiking at Fort Caroline. Try to hang ten just off the coast at Hanna Park, and show off your rhythm on a dance floor at Jacksonville Landing. The possibilities are endless. Palm trees, southern charm, and miles of trails: A world of wonder awaits when you book one of the cheapest flights to Jacksonville on Travelocity. Prepare your senses for delightful sights and sounds, and bring your compass for an excursion in Timucuan Ecological and Historic Preserve. It all starts with Jacksonville plane tickets and an adventurous spirit, savvy traveler. Let’s get going. Need insider tips on must-see attractions in Jacksonville? Check out our Jacksonville travel guide! Nice hotel on the river. There’s a waterfront construction project in progress, so the view of two cranes is not ideal. There will be noise, too.